Ishigami M. et al., A simple method for the continuous production of carbon nanotubes, Chemical Physics Letters, Vol. 319 , No. 5 (2000) 457. Biro' L. P., et al., Continuous carbon nanotube production in underwater AC electric arc, Chemical Physics Letters, Vol. 372, No.3 (2003) 399. 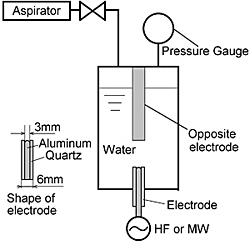 Kadowaki K., et al., Space charge effect for streamer initiation and propagation in water subjected to reciprocal traveling wave voltage pulse, IEEE Transactions on Dielectrics and Electrical Insulations, Vol. 13, No. 3 (2006) 484. 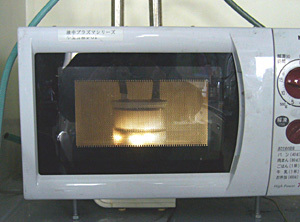 S. Nomura and H.Toyota, Sonoplasma generated by a combination of ultrasonic waves and microwave irradiation, Applied. Physics. Letters, Vol. 83 (2003) 4503. S. Nomura, H. Toyota, S. Mukasa, H. Yamashita, T. Maehara, and M. Kuramoto, Microwave plasma in hydrocarbon liquids,Applied. Physics. Letters, Vol.88 (2006) 211503-1. S. Mukasa, S. Nomura,and H. Toyota, Observation of microwave in-liquid plasma using High-speed camera, Japanese Journal of Applied Physics, Vol. 46, No.9A (2007) 6015. S. Nomura, H. Toyota, M. Tawara, H. Yamashita, K. Matsumoto, Fuel gas production by microwave plasma in liquid, Applied. Physics. Letters, Vol. 88 (2006) 231502-1. 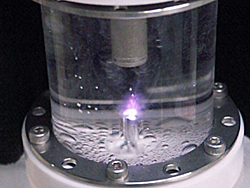 T. Maehara , H. Toyota , M. Kuramoto , A. Iwamae ,A. Tadokoro , S. Mukasa , H. Yamashita , Ayato kawashima and S. Nomura, Radio frequency plasma in water, Japanese Journal of Applied. Physics, Vol. 45, No. No.11 (2006) 8864. A.Kawashima, H. Toyota, S. Nomura, T. Takemori, S. Mukasa, T. Maehara, H. Yamashita, 27.12MHz plasma generation in supercritical carbon dioxide, Journal of Applied Physics, 101 (2007) 093303.